Christmas is celebrated to remember the birth of Jesus Christ, who is believed by Christians to be the son of God. Christmas is a big holiday season in Europe and North America and other nations. The economics is huge. USA alone spends about 600 billion dollars in the season. Although the festival is celebrated with much fanfare and happiness in Europe and NA, the attendance at churches is decreasing in these countries. In contrast, Church attendance is 90% in Latin American and Christian African and South East Asian nations. Hence, in order to spread its gospel, the church to has identified hotspots in Latin America (Brazil), Africa (Nigeria), China and in South East Asia (Indonesia, India). Although in India, official statistics estimate 2.5 % of the population to be Christians, general consensus places the figure at about 5-6%, while scarier estimates mention much higher figures. Predominant presence of the Christians in India is in south and north-east of the country but the church has successfully broken into North India and neighboring Nepal in spite of anti conversion laws in some states of India and in Nepal. Churches in India get hyperactive during Christmas. All sorts of public gatherings (called Prayer and healing meetings, 2nd coming of Jesus gatherings etc.) 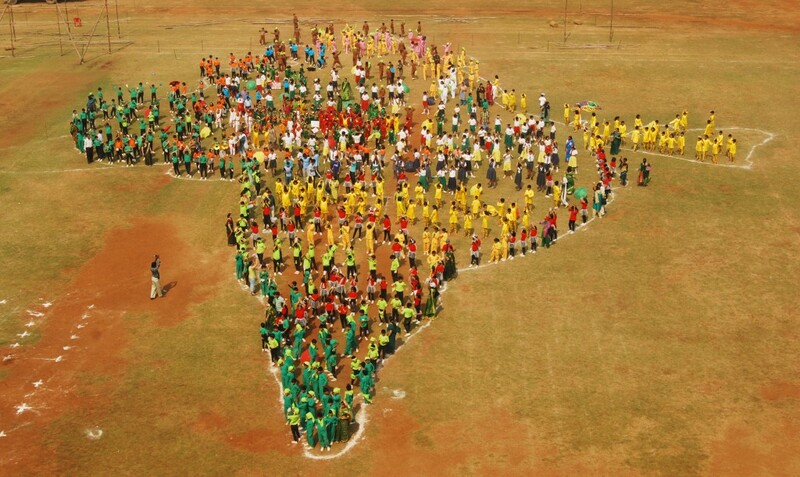 are organized across the states (more importantly in central and south India). It is a big occasion for the churches to raise money, travel to the hinterlands of the country in the guise of singing groups and of course induce conversions. The recent arrest in Madhya Pradesh of carol singing groups trying to convert people is a case in point – http://www.bbc.com/news/world-asia-india-42363561. Churches go overboard in the celebrations. In the coastal states miles and miles of stars are everywhere. Pamphlets, Gifts, Books are distributed and gatherings organized. Political leaders are eager to join the celebrations to protect their vote banks. The above methods were deployed earlier in Christianizing Europe, Latin America and Africa. Clearly India should stand up to the continuous attempts to destroy its culture and hijack its people from their roots. The church is pulling no stops to take Christians in India away from their ethnic identities and cultural values. It is using propaganda to distance our people from their age old practices. It is now or never for this country to stop this inculturation. This entry was posted in Exclusivist religions on December 25, 2017 by skandaveera. The self-proclaimed liberal mob as usual gets to thought-street fighting the moment anything Hindu is in question. Suddenly from their hate for Hindu orthodoxy, they prefer pretending more authentic about Hindu scriptures when it comes to practices that “Hindutva” rally for, trying to show how the Hindutva hooligans are not true Hindus. Now with the cow butchering and beef eating while they tried on the one hand to uphold freedom of enmasse butchering of cows, on the other hand they tried teaching that Hinduism is not inherently opposed to it (and example here) and that ‘original Hinduism’ that the Hindutva hooligans don’t have a grasp of but the liberal intellectuals have. While the dishonesty and bullying of liberals is notorious enough and while countering the liberal position is a meaningless exercise (for, their arguments have no root only their motivations have root in their inherent anti-Hinduness) we should definitely understand how Hinduism sees this issue and what are the various aspects involved in understanding any such issue. For that we can use some of the absurd liberal arguments as contrasting positions rather than try countering them. This is not really a case against cow slaughter in the sense of pointing out problems in cow slaughter or merits in not slaughtering. Nor is this really a refutation of liberal arguments. One of the usual arguments is that “originally” Hinduism did not see cow killing as a taboo and that cow-worship is of “recent” origin. This is not really just about a problem of fact but worldview. Of course, neither fact nor logic favor such view. On fact – literature has two kinds of references, instructive and demonstrative. Instructions for a ritual tell us that certain practices were part of certain rituals. There are then allegories where there are citations for those practices really being in effect. So for instance if one quotes the procedure for aSvamedha as a proof of certain practice, one would do well to recollect how many aSvamedha rites are indeed possible, given that the whole of AryAvarta can only have one living performer of aSvamedha at any given point of time. Instructive examples from literature have very few mentions of cow killing. An overwhelming majority of paSu sacrifices do not involve cow as a paSu. Even a ritual like cow-sacrifice that one can show as example is quite remote and cannot be done as a regular or even as an occasional rite. For that matter Hindu thought is comprehensive and its various traditions have practices ranging from the most insufferable “sanctimony” to the “goriest” ones. On the one hand there is the monk who tries to avoid hurting insects, and on the other hand is the naramedhin who sacrifices human self. So to try telling what is “originally in Hinduism” to Hindus is to try showing candlelight to the sun. Hindus in general and “those Hindutva hooligans” in particular, are well aware of the spectrum of Hindu thought, its breadth of practices. The presence of some ritual hardly indicates a general practice. What indicates a general practice is the anecdotal evidence we get from literature, not the instructive evidence. Anecdotal evidence from literature has several examples like Surabhi, Sabala, Kapila that do not tell us the story of cow-killing but of cow worship. Rituals like cow-sacrifice come out as remotest, with not many examples to recall from the whole of veda-itihAsa literature. Examples like Vishwamitra taking calf come across rather as exceptions, both by volume and by where they belong – to the forest outside the village-town living. The bulk of literature sees cow as the nourisher, hence the mother. 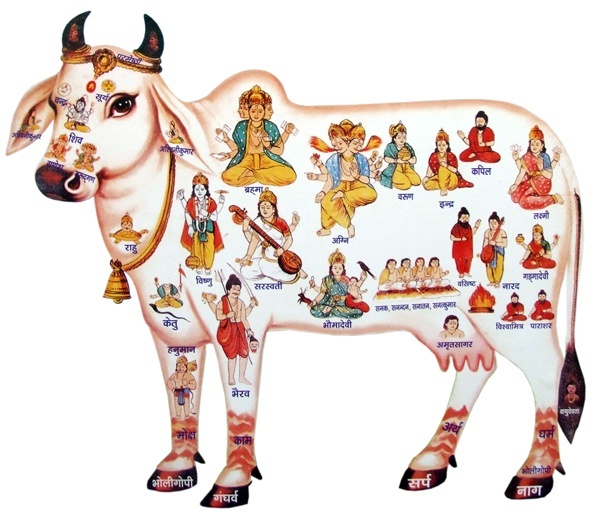 Protection of cow remains the theme of several allegories right from Indra-Panis of Veda (RV 10.108) to the episodes like gograhaNa of Mahabharata and where Arjuna saves brAhmaNas’ cattle from thieves (where he also breaches the no-entry norm by intruding the place of Yudhishthira & Draupadi). All these show cow as a rather precious wealth sought to be protected, not an edible to be preyed on and predated. The literature is full of instances of cow donations, praise of cattle stock as one of the greatest riches. 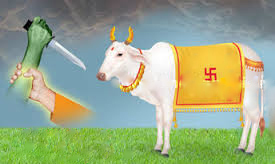 Whether it is ghosha yAtra where dhArtarAshTra-s use the guise of surveying their cattle wealth in the forest or the go-grahaNa where the cattle grazed feely outside the town and had nominal protection from wild animals, it is clear that cow simply could not have been a slaughtered animal. There are a lot of references to meat – vAtApi taking goat form etc. There is also the fact of evolving practices where paSu bali in many cases, over time, got replaced with a symbolic paSu to avoid killing of animals. A brief narration can be seen here and here. However most of these do not narrate cow killing or cow eating. Even instances of beef turn out to be minimal, not just cow. While the presence of meat eating and recommendations to avoid meat can be seen as half-full vs half-empty glass (there are both), beef examples are too few to indicate any norm or widespread practice. 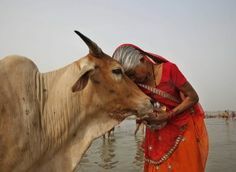 Agrarian and pastoral societies heavily depend on cow and in India where divinity is attributed to nature and not just supra-natural, it is not surprising that cow is worshiped. It is only logical that the Hindus do not see cow as their food but as a food-giver. The instances of farmers searching for their lost cows, finding their cows getting killed by butcher-thieves in slaughter houses and committing suicide unable to see the horrific butchering, is something not just of fact that the liberals hide but a natural happening that would occur to any thinking mind. This is also in line with the way Hindus and others look at nature herself. For Hindus nature is the mother( see “Nature as Teacher and the Trustee” under this), the giver of instruments of enjoyments including their own upAdhi-s and not the one to be enjoyed herself. Mother is the food-giver, not food herself. Mother is the giver of means of enjoyment, not the one to be enjoyed. For the abrahamists nature is not divine and nature is to be enjoyed and conquered. So it is only logical to see how differently they see cow from Hindus. Civilizational commonsense thus suggests that Hindus naturally do not see cow as their food. Those who suggest that Hinduism “originally had” beef-eating and that cow-worship is of “recent origin”, besides being factually wrong, fail to understand that Hindu sampradAya-s unlike book-cults are evolving and quoting some “ancient” text as if that is “original” only demonstrates the critic’s un-Hindu and Abrahamic thinking. Lived tradition is what is original, for Hindu traditions are experiential and not book-cults. So something being of recent origin does not make it any less Hindu. It in fact reinforces the fact that they evolve to suit the times unlike time-warped book-cults that exhort beliefs and practices that do not suit evolving human societies. We also have wise men who say that man originally ate meat and he took to vegetable eating much later in evolution. While they tried to use it in support of meat eating, this is in fact a supporting argument for those against beef, for civilizational progress would mean you take to newer and more refined practices by leaving the older ones. The beef lovers (for the sake of attacking Hinduness not really lovers of beef) first said that many Hindus do eat beef and that only a “few” sections of Hindus are against it. But it turns out that politicians, more aware of Hindu mood, though first tried this line of argument, are having to go back and not attribute such thing to Hindus. There are multiple reasons for this. First of all it is not just the elite that keep and worship cows – the agrarian families are the ones that do it. The majority of this nation does so. Second, Muslims did not kill cows because they liked them but because Hindus hold them sacred, similar to the way they destroy temples not out of love for their own cult but because they have to offend the kafirs as a sacred duty. While this can go well with Hindu hating liberals, it cannot go well with any section of Hindus regardless of whether they themselves eat meat or even beef for that matter. Having flunked in their attempt to divide Hindus on “practice” matter thus, some “intellectuals” now have to try digging out evidence to embarrass Hindus saying how their ancestors ate cows. But then, that falls flat for the above reasons. Both because our ancestors held cows holy and precious and because we are not book-cult followers to blindly do what our ancestors did and can do better with the knowledge they gave us. One argument we hear is that these are matters of personal choice and we should not have legal sanctions such as prohibition of cow slaughter. But the same applies to many matters of personal choice such as monogamy into which laws make socially unwelcome intrusions. How much law should mandate how much should be left to social and personal self-regulation depends on multiple factors, considering two of them here as examples. First, whether the present social circumstances need state to interfere or whether the prevalent situation is healthy and under manageable limits. On this, matters like cow slaughter need more legal intervention today than many other matters. Second, whether a matter is happening because of or in spite of society. If something is a problem inherent in the society and the state is trying to enforce a noble change, such as overcoming oppression and discrimination, state has a case to make acts that bring society out of such practices. 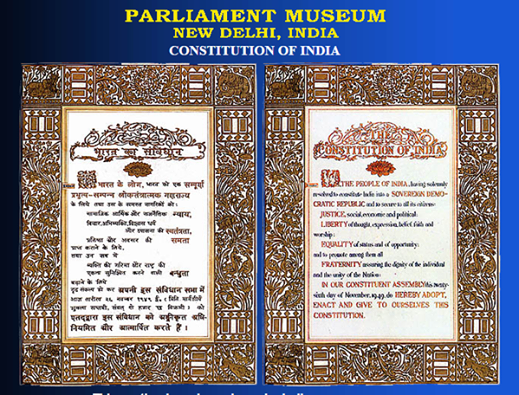 By norms of civilization, especially seen from the most civilized society’s worldview namely Hindu worldview, which at least by the claims of original constitution forms the basis for Indian state, state does have a case to make enforcements against cow slaughter. It is also the case that society at large is opposed to cow slaughter and that it is done by enemies of Hindu society both for provocation and to foster an anti-Hindu environment in the country. Even because of this the state has every reason to legislate against cow slaughter and enforce it. This entry was posted in Hindu Dharma, Social Issues, Threats on November 6, 2015 by skandaveera. Devi Navaratri and Vijaya Dasami is one of the most celebrated for Hindus all over the world. There are several stories of victory, of the noble over evil, associated with Aswiyuja Dasami. The first ten days of this month are celebrated as Navaratri culminating in Dasami the day of victory. As per traditions these are the nine days when Devi’s divine armies fought and eliminated Asura armies. While Devi Navaratri is celebrated by all the Sakta traditions, it is celebrated primarily as Candi tradition. The Godhead is called Durga, Candi, Candika, Camundi. Devi Navaratri story is best narrated in Markandeya Purana as the celebrated Candi/Devi Saptasati, also called Devi Mahatmya. It is a thirteen chapter narrative of seven hundred verses. The 13 chapters are grouped into three caritra-s or main stories. The presiding deities of the three are Maha Kali, Maha Lakshmi and Maha Saraswati. In the ancient Sankhya traditions these three main deities represent the three primal qualities of nature: tamas, rajas and satva. The three stories of Devi also are symbolic of these qualities. In Vedic imagery the principles (tatva-s) underlying these three qualities are represented by Agni, Vayu and Surya. The corresponding powers (Sakti-s) are the devi-s nandA, SAkambarI and bhImA. This is in contrast to the other great tradition of Lalita, where the three main divisions are those of energy instead of qualities: the powers of will, knowledge and action (iccha, jnAna and kriya). A king Suratha and a trader Samadhi arrive at Rishi Medha’s abode, the king having lost his kingdom to enemies and the trader being driven away by his greedy wife and sons. Devi’s glorious deeds are narrated to them by the Rishi. Having heard the narrative with great attentiveness and meditated on Devi, Suratha and Samadhi regain their lost possessions with the grace of the Mother and return happily to their places and positions. The first story is that where Vishnu, having vanquished Asura-s, goes into yoga nidra. From His ear and nasal wax two Asuras named Madhu and Kaitabha emerge. As they trouble the worlds, Devatas try waking up Vishnu. They fail to awaken the great god, and prey Devi the Yoga Maya/Maha Maya. With Her undoing Maya Vishnu wakes up and slays the two Asuras. The Devi that wakes the universe from its Tamas, is Maha Maya. 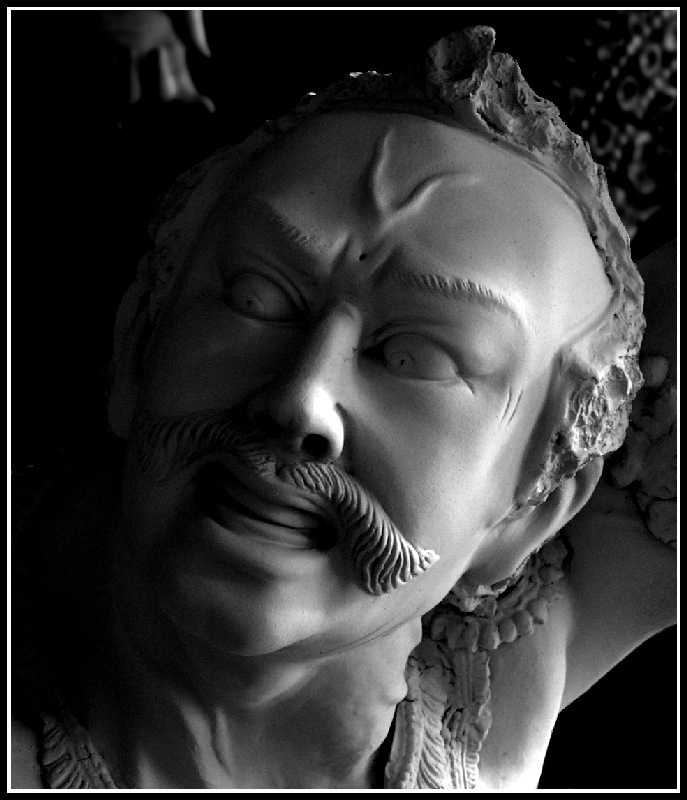 Maha Kali is the presiding deity of this story. Its Rshi is Brahma and seed power Rakta Dantika Devi. The second story is of Devi Durga/Mahishasura Mardini. The powerful Asura King Mahishasura defeats the divine armies of Indra and having lost swarga to the enemies Indra and other Devatas approach the primal Gods Vishnu and Siva. Then the three primal gods (trimurty) with their will give their energies unto a common form. All the devatas contribute their powers to the form and the collective energy form thus resulted, takes the form of the primal energy/Para Sakti Durga. 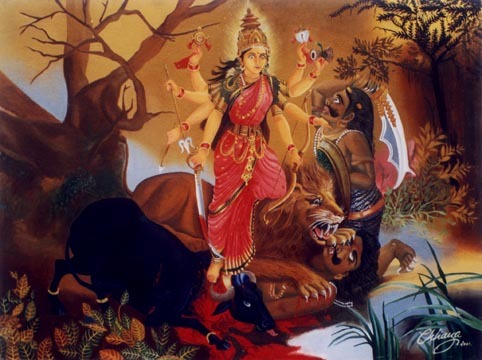 Exceedingly beautiful, radiant, powerful, possessing all forms of weapons and riding a lion, the Mother is worshiped by the Devatas and then assures them of success. The Devatas who lost a hundred battles to the Asura hosts, set into the war led by Durga and her armies of feminine divinities. In a fierce battle thus ensuing, Devi’s armies destroy Mahisha’s armies. 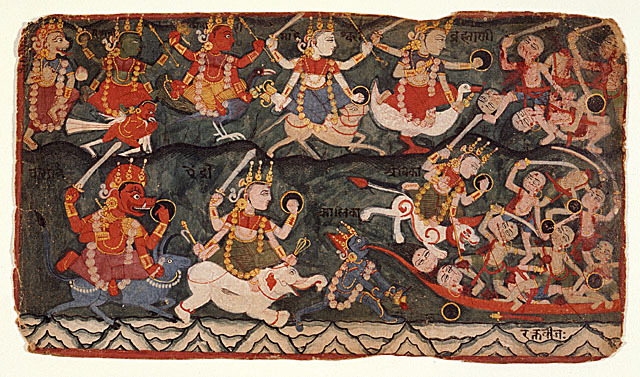 Devi slays Mahisha’s best generals such as cikshura, cAmara, udagra, uddhata, bAshkala, tAmra, andhaka, ugrAsya, ugravIrya, mahAhanu, viDAla, durdhara and durmukha. 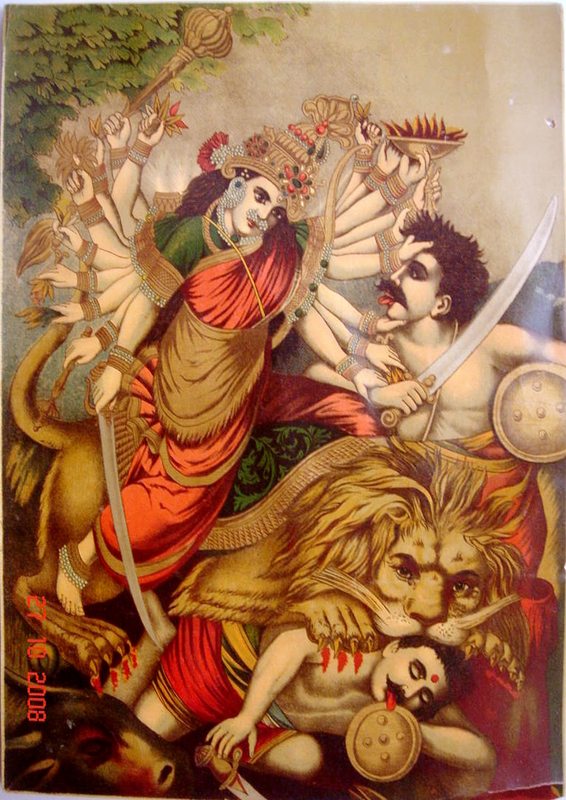 Then the Mother, riding Her fierce lion, destroys Mahisha’s remainder armies along with their lord Mahishasura. Devatas, liberated from their troubles, profusely praise Devi and her grace, beauty and powers. This story is the one of victory over the second of natural qualities, rajas. The inertia of sleep and its fruits represent Tamas in the first story, which Devi wakes the world from. In this story Mahisha represents the rajo guNa, from which Devi leads the seeker to a superior consciousness quality of knowledge, the satva guNa. Maha Lakshmi is the presiding deity of this story. The Rshi is Vishnu and seed power Durga. The third story is the most elaborate one of the three and the one that fulfills higher cravings of beings. It represents the numerous complex struggles in the higher reaches of nature and the ultimate taming of those with divine grace. Its consciousness quality is the satva guNa and presiding deity is Maha Saraswati the Goddess of divine Vidyas. Rudra is the Rshi and seed power Bhramari Devi. As the third story begins, Amba, the Devi canDikA is worshiped by the Devatas. As two asuras canDa and munDa come to know of Her unparalleled beauty and grace, they narrate it to their lord, Sumbha the king of asuras. Sumbha, wanting to marry Her, sends a messenger with his proposal. Devi replies that She will be obliged to marry only the one who defeats Her in a battle. Sumbha, knowing of this, sends his general dhUmrAksha with an army to defeat and bring Devi unto him. As dhUmrAksha declares the war, Devi attends with Her divine armies and effortlessly kills the general along with his army. 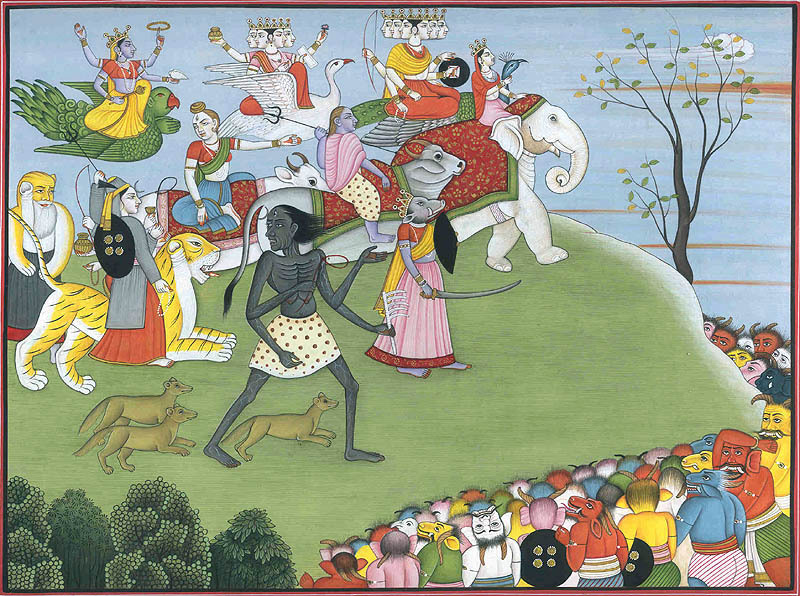 Having lost dhUmrAksha, canDa and munDa set out with their armies to fight Devi. In the terrible encounter Devi deputes Her fierce power kAlI to destroy the enemies. Divine armies rout the monster’s armies. kAlI of terrible feats kills both canDa and munDa fearsomely and returns to canDikA the Mother, having worn their heads in a garland. Sumbha and niSumbha then dispatch their generalissimo raktabIja along with all their generals leading a large host to wage and win an all-out war. udAyudha with his eighty six, kambu with his eighty four, koTi vIrya’s fifty and dhUmra’s hundred armies followed raktabIja. kAlaka, daurhRda, maurya, kAlakeya also set out with their deputies and host clans. In the fierce battle Devi assumes all the Devata powers in feminine forms: nArasimhI, kaumArI, aindrI, vaishNavI, mAheSvarI, cAmunDI, brAhmI, vArAhI etc. These are called the mAtRka powers, seven of which are primal. Devi’s divine armies, led by Her deputy kAlI, rout the asura armies and generals. On eighth day of the battle, raktabIja invokes his mystic powers because of which every drop of his blood falling on earth gives rise to a new raktabIja. The field infinitely multiplies with the asura as their blood flows and each of them fights fiercely. As Devi’s weapons injure the asura more, the more his forms multiply. To vanquish the asura kAlI the Mother with large tongue, spreads Her tongue in the entire field and drinks off all the blood as it spills even before it reaches ground. Dried of his blood, the asura becomes powerless and Devi slays him. The day of his killing is said to be the most fearsome day of the war and is celebrated as durgAshTamI. Finally niSumbha the powerful asura is slain along with his army, following which Devi kills Sumbha the lord of asura-s on the ninth day, celebrated as maharnavami. Freed from asuric tyranny, Devatas worship Devi and the graceful mother, pleased with the praise, grants boons to the Devatas. This is the story of sAtvik struggle and divine grace helping the seeker grow over even the third quality of consciousness, resulting in a triguNAtIta or the realization of absolute reality. The king and virtuous trader, Suratha and Samadhi, by the virtue of listening to the stories with devotion and meditated on Devi, attain the grace and vision of Devi who then grants boons to them. They regain their possessions and positions and return. The nine days of war in which divine armies vanquish the forces representing dark side of nature are celebrated as the Devi navaratri-s, consummating in the tenth day as vijaya daSami or the celebration of victory. The presiding deities of these nine days are nine forms of Devi, called navadurga-s. They are SailaputrI, brahmacAriNI, candraghanTA, kUshmAnDA, skandamAtA, kAtyAyanI, kAlarAtrI, mahAgaurI and siddhidAtrI. This is the navArNa nAma mantra of Devi which can be chanted at any time without formal initiation: Aum namascanDikAyai namaH. This is also the day on which Arjuna vanquishes Kaurava host in gograhaNa, during their ajnAta vAsa. Devi mAhAtmya is among the most celebrated texts of Hindus and unlike Sruti and some of the Saiva vidyas which are primarily dvija practices, canDI worship is meant for all four varNa-s. Besides, canDI worship is said to be especially suitable for kali yuga, through the saying “kalau canDI vinAyakau”. 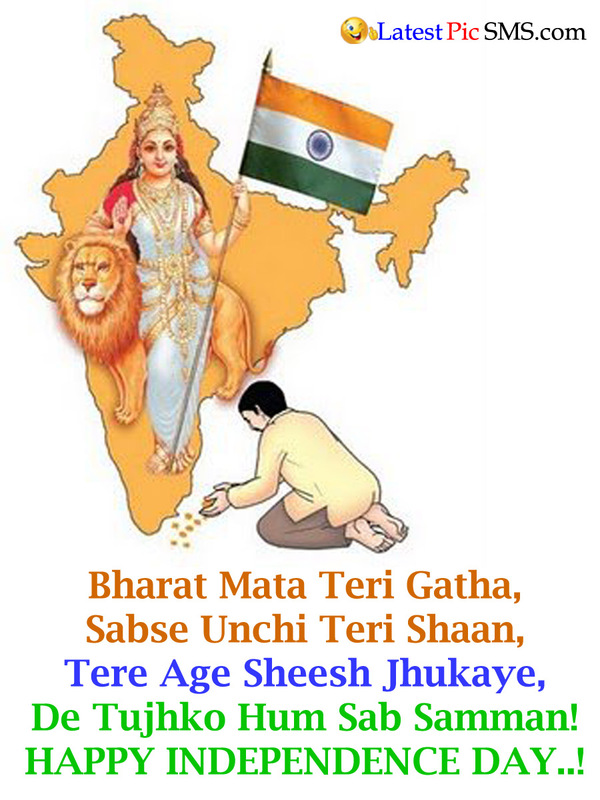 May there be peace and prosperity in the society by the grace of the Mother. Some hate groups have been trying to celebrate Mahishasura instead of his slayer. As per them, Mahisha was a low caste representative who was oppressed (Devi high caste?). While the wise of India cannot obviously dare read misogyny into any of the anti-Hindu campaignds assuming the color of caste hatred, we need to understand why Durga puja is attacked. Similar to Rama, Durga is one pan Indian celebration which cuts across all groups. The way the Aryan Brahmin Ravana was projected as a representative of Dravidians, the high caste Mahishasura is projected as representative of so-called low castes. Truth or logic almost never matter for hate campaigners, what matters is whether they are succeeding in destroying the society. To that end, driving a caste wedge by projecting these traditions as representing high caste oppression is a means. The motivation, the politics, the stake holders should by now be clear: the enemies of Hindu nation trying to shoot at the society over the shoulders of those they claim to represent and take hold of, who in fact they never represented or benefited. But if truth is to be ascertained, one needs to do no more than scratching the surface. Devi’s forms are just as percolated in the so-called low castes as in the so-called high castes. In fact it is more so among the former than latter. The main grAma devatas are no different from the primary Agamic devatas: Maisamma=Mahisha mardini, Renuka=Chinnamasta and so on. The “non-sanskritik” forms are not really so: in the several layers of practice they happen to be no less orthodox than the “sanskritized” practices of nAma pArAyaNa. Devi worship, be it Sakti pITha-s (geo-religious) or vidyas or bhakti, has been a marvelous integration motif in this nation. It is for this reason that it is being targeted, and it is for this reason that a proper understanding of these traditions is required among those committed to the cause of national integration. Devi the Mother Nature is pervasive and the protector of continuities, and like Her sibling Vishnu, She assumes infinite forms from time to time to protect Her devotees and those who stand for Dharma. May She incarnate again to uphold Dharma and Sampradaya through which She Herself manifests. “sA canDI navakoTi Sakti sahitA mAM pAtu viSveSvarI”. This entry was posted in Hindu Dharma and tagged Candi, Devi, Durga, Mahishasura Mardini, Navaratri, Vijaya dasami on September 25, 2014 by skandaveera.